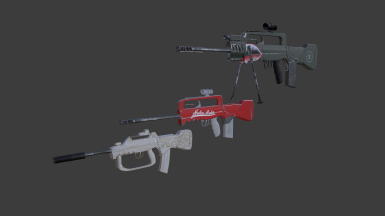 Adds a high quality Famas to the Commonwealth with a whole range of mods! Edited materials to try and fix the rain bug once and for all. Added different glass to the ACOG to try and avoid scope issues. Adds a brand new, standalone, Famas assault rifle to the Commonwealth! The gun includes custom sounds and animations! As usual remember to backup your save before installing any mods. I take no responsibility for any broken saves. If you find any bugs please use the bug report feature and include as much detail as possible. Includes custom animations! These are added into their own race and wont interfere with any other animations. Integrated into the levelled list through scripts which will avoid any incompatibilities with levelled lists. Compatible with See Through Scopes. I highly recommend getting this as it allows customisable reticles for the ACOG scope that NLPH was too lazy to do! Now compatible with New Calibers!! Get the patch here. 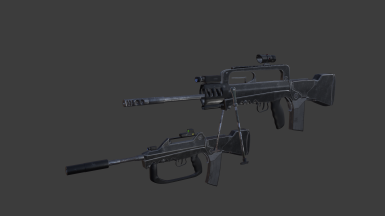 A compact version of the weapon has been made. Get it here! The flashlights dont actually follow the gun while holstering/lowering your weapon. Not a major bug by any means but if anybody knows how to fix this, please PM me. Drag0nDr0p - The spectacular 3 round burst script!